The editors and contributors of Unwatchable joined us for a panel discussion at the Co-op on January 28, 2019. Pictured above, from left to right, is Laura Horak, Nicholas Baer, W.J.T. Mitchell, Jonathan Rosenbaum, and Maggie Hennefeld. Laura, Nicholas, and Maggie joined Colin before the event to discuss the various authors and popular culture that informed their collection of short essays that explore the concept of the "unwatchable." Our episode opens with this discussion on what it means to write on phenomena that one cannot endure to look at––examples ranging from viral videos of police brutality, Plato's allegory of the cave, to the divisive Oscar nominee, La La Land. Stay tuned for an overview of the various authors that both contributed to and thematically informed Unwatchable, including texts on art house cinema and feminist theory as well as works from Susan Sontag and Judith Butler. For a full list of the editor's picks, you can check out their selected bibliography here. Our episode also features an "unsung hero" of the bookstore, the re-shelve cart. While it is "greeted with varying levels of frustration by the staff," Co-op Manager, Adam, muses on the cart's value, despite its broken wheel. 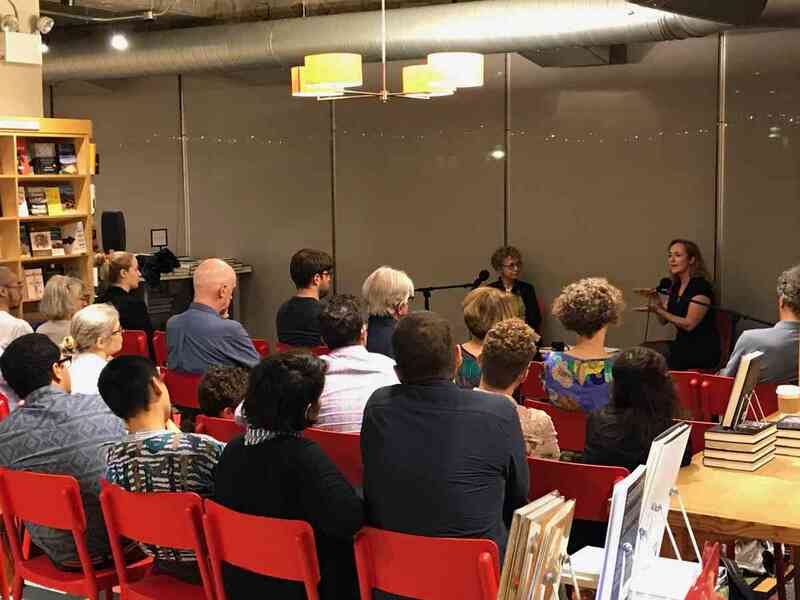 Rachel Galvin (right) discussed her book, News of War, on October 8, 2018 at the Co-op with University of Chicago English Literature professor, Maud Elmann (left). In our episode, Galvin explores the influence that war has on non-combatants from the poet's perspective as well as poetry as a form of journalism. Galvin's examines the work of wartime poets such as César Vallejo, W.H. Auden, Wallace Stevens, Raymond Queneau, Marianne Moore, and Gertrude Stein. For some of Galvin's own lyric poetry, have a look at Pulleys & Locomotion and Elevated Threat Level. Comments, questions, etc? Drop us a line at podcast@semcoop.com.